In 1982, when The Dark Crystal was released, it set a new benchmark for special effects, in particular its use of models and puppets. While today, in a world of million-dollar computer graphic budgets, the impact of its special effects is more difficult to appreciate, it is still a remarkable piece of work, and one which I still consider a benchmark. Directors Frank Oz and the late, great Jim Henson, both legends in their own right, weave a magical journey in a mysterious land. A journey which, unlike many of today’s movies, captures the imaginations of children and adults alike. I first watched this film when I was in primary school. I was transfixed by the characters and their struggle. The plot is not obvious, nor is it simple or dumbed-down in any way. The film, although primarily aimed at children, doesn’t do what most films aimed at children do, which is pretend that children are the most unintelligent subgroup of the human population. In fact, it does quite the opposite. Herein is where the film gets most of its value, the characters and story draw the viewer into the world of the movie without the cop-out method of explaining everything explicitly. The script is intelligent and the character motivations aren’t always what they seem. When I came back and watched this movie some 15 years after I first saw it, I was amazed to find myself still drawn into the world of the Mystics and the Skeksis, still sitting on the edge of my seat while Jen and Kira fought their way to the conclusion of this whirlwind adventure. From the start, the viewer is placed in a world which is clearly not our own, the main characters are quickly established and the narrator tells us all we really need to know. Jen, a Gelfling, is a human-like creature who has been raised by the Mystics, powerful peaceful beings, because there are no more Gelflings left, or so it would seem. 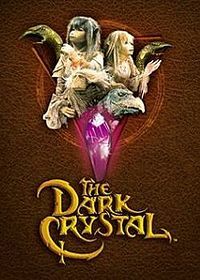 He is sent on a quest to fulfil a prophecy and repair the “Dark Crystal” a crystal which is the source of balance and truth in the universe. If he does not succeed before the three suns converge, then darkness will reign forever. Typical fairytale stuff really. As the film draws to its conclusion, you can’t help but feel involved in their world. You are not so much a viewer, but a participant and if you can suspend your disbelief and not get distracted by the somewhat dated special effects, then this film is a truly worthwhile experience. My only qualm is perhaps that the movie is too short, at times it the screenplay seems ever so slightly rushed. It would have done well to spend even more time developing the characters and background story. I dare you not to be helplessly charmed by the characters and emotionally involved in the story. Great Journey, great story, great movie, just a bit old and a bit rushed. 4.5 Stars.